Gianfranco Ferré has died thirty minutes ago in Milan after suffering a brain hemorrhage on Friday night. He was 63. Giorgio Armani praises Ferre's "dignity, calm, sense of responsibility". Ottavio and Rosita Missoni remember "the sincere hugs we exchanged, the way old friends do. Our sorrow is intense". Gianfranco Ferré (above with you-know-who) is a figure well-known in the world of opera (regardless of the fashion-initiated), as having been Renée Fleming's dresser since 1998, using his vast couturier skills to make Renée flemerific. Ferré has dressed Renée in a wide spectrum of craptastic to elegant gowns, but has always kept us entertained with his overall elegant and feminine designs for la Renée (who also wears many of the late designer's creations off-stage). Back on November 5, 2006, OC was guest at the Teatro alla Scala Renée Fleming recital, which was co-collaborated with Gianfranco Ferré. He not only dressed Renée for the performance (o welps have pictures to share...but u noes the drill), but also supplied gowns for a Ferré-hosted after-par-tay in his Corso Garibaldi/via Pontaccio #21 head office after the show, where Renée showed-off another one of his evening gowns. Earlier that evening at the theater before Fleming took her bis, she graciously gushed from cue-cards in Italian that Ferré was 'un grande amico'. You can go here to the Opera Chic flickr photostream to see more images of Renée and Ferré at the after-party. Girl looked good...str8 hustlin that night. First tier grade A number 1. Very sad news for fans of design and opera lovers: Italian designer Gianfranco Ferre' has been hospitalised yesterday and is now critically ill with what Italian news agencies have described as a critical neurological condition (there is talk of a brain hemorrhage). Ferre', 63, a person of limitless curiosity, one of the most cultured men in the design business, and a classical music lover, is a a patron of the arts and a sponsor of many great events. 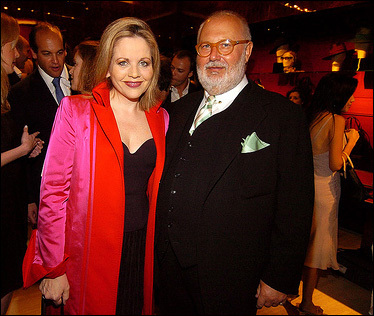 Ferre' has also designed Renee Fleming's stage gowns since 1998.